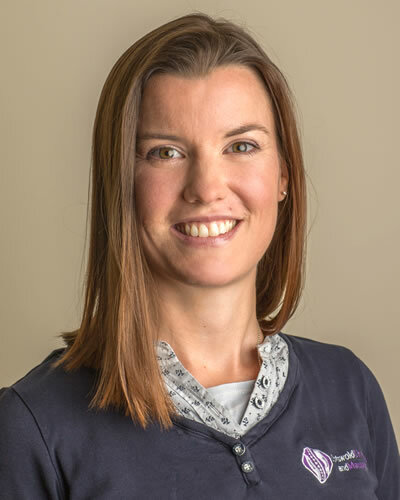 Claire is a Dr of Chiropractic who graduated from the world renowned Anglo-European College of Chiropractic (AECC) in 2005 after completing an Honours and Masters degree. Claire is a musculoskeletal expert and patients present to her with a wide range of mechanical problems ranging from neck pain, back pain, tension headaches or injuries. Claire understands that no one technique will work for everyone so she is qualified in a range of techniques including specific joint manipulation, dry needling (a form of medical acupuncture), kinesio-taping, blocking and mobilising. One of the most important aspects of Claire’s work is having a good relationship with her patients. Patient’s wishes and needs are important to her. Her clinics are always busy and she has patients ranging from just a few days old through to 94- years old. No one day in clinic is like another and she thrives on the variety of complaints that she sees. Claire is married to Dave and is mum to Chloe and Olivia. When she is not busy in clinic she loves spending time with her family. She enjoys creating healthy dishes in the kitchen and growing her own organic vegetables. Claire has recently started yoga for relaxation and when she has time she enjoys running on the common in Minchinhampton. Claire is a member of the British Chiropractic Association, College of Chiropractors and is fully registered with the General Chiropractic Council. As part of her continuing professional development (CPD) she attends several courses in order to keep up to date with relevant and interesting developments in her scope of practice. In the future Claire hopes to complete further studies in Functional Muscle Testing Techniques as well as advanced Nutrition.